Reading John le Carre always makes me realize that a good mystery does not need to be fast-paced. In this book, as well, le Carre takes his time introducing us to the different characters and creating an apt background for the story that is about to begin. I like the slow-ish pace, because the writing is engaging and the descriptions are very close to real. That being said, the book is certainly action-packed. The opening scene itself is a carefully arranged bombing that takes place in Berlin, which leads to the events of the book. 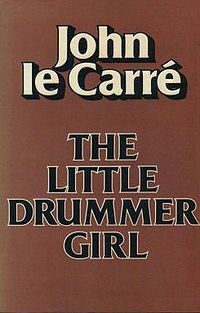 As with all his books, le Carre's characters are introduced and depicted with skill. I really do appreciate the kind of effort the author takes to make his settings seem not only realistic but also relatable to the common readers. The central character in this story is woman named Charlie; the little drummer girl; a mediocre English actress, a flower-child/gypsy of sorts, who is recruited by the Israeli intelligence to track down a Palestenian agent. Her role in this 'theater of real' is that of a terrorist's lover, whose brother they are trying to capture. "Her name was actually Charmain, but she was known to everyone as "Charlie", and often as "Charlie the Red" in deference to the colour of her hair and to her somewhat crazy radical stances, which were her way of caring for the world and coming to grips with its injustices. She was the outsider of a rackety troupe of young British acting people who slept in a tumbledown farmhouse half a mile inland and descended to the shore in a shaggy, close-knit family that never broke up. How they had come by the farmhouse in the first place - how they had come to be on the island at all - was a miracle to all of them, though as actors they derived no surprise from miracles." The writing, as you can see, is descriptive; and there's a tinge of dry humour to all of it. In what outwardly seems like just another mystery, the author talks about morality and identity; it's not a book about political conflicts; but about how these conflicts affect the people. Now I haven't read any other spy novelists, like Graham Greene or others, so I am no expert on spy stories. But, I do read a lot of mysteries and this is one of the best ones I've read. Last month I read three of his Quest For Karla novels back to back and I second all that you wrote about le Carre's style. Marvellous. Please try Tinker Tailor Soldier Spy, a masterpiece. I should try these Quest For Karla novels next, thanks for the idea :) I've read Tinker Tailor Soldier Spy, and I agree, it really IS a masterpiece!